Proposal submission deadline is February 15, 2019. Please submit a 250-word abstract and separate two-page CV/resume to VietnamConference.TTU@gmail.com. The program committee of Ron Milam, Steve Maxner, Justin Hart, Dave Lewis, and Laura Calkins will evaluate all paper proposals and develop a program that reflects the many remarkable aspects of 1969. If submitting a panel proposal, please include separate abstracts for each proposed presentation and CVs/resumes for each speaker. The Vietnam Center and Archive (VNCA) and the Institute for Peace & Conflict (IPAC) at Texas Tech University are pleased to announce a conference focused on the year 1968 and the Tet Offensive. We expect in this conference to approach these historical events in the broadest possible manner by hosting presenters who examine diplomatic, military, international regional, and domestic aspects of the Vietnam War during that year, as well as the strategic and tactical decision-making and actions that led up to and followed the Tet Offensive. This will include presentations that look at all participants to include the US, RVN, DRV, NLF, and the numerous allies and other nations involved. We will also strongly encourage presentations that examine the antiwar and peace movements at home and abroad, the efforts to support the war effort, and the efforts to end the conflict through international diplomacy, as well as military and diplomatic means in Vietnam and Southeast Asia. Recent and emerging scholarship on the Tet Offensive and on 1968, more broadly, is refocusing much needed attention on some of the pivotal events that took place during that fateful year. In late November 1967, General William Westmoreland publicly conveyed his optimism regarding eventual US victory in Vietnam, helping President Johnson to buoy flagging US popular and political support for the war effort. In the aftermath of the Tet Offensive, as fighting broke out in every major city throughout the entirety of South Vietnam, many started to doubt the veracity of those previous claims, including prominent politicians and members of the American media. Attention within the US came to focus on some of the more brutal battles that emerged as US Marines fought to retake Vietnam’s ancient Imperial city in the Battle for Hue and they came under heavy fire during in the Siege of Khe Sanh. As the fighting intensified in Vietnam, so it did in the streets and on campuses across America, as critics of the war continued their calls for an immediate US withdrawal and an end to the war. So powerful was the effect of these events that on March 31, President Johnson announced that he would not seek reelection – adding to the leadership changes already in play with the departure of Robert McNamara as Secretary of Defense in late February and the emergence of General Creighton Abrams and departure of General Westmoreland as commander of US forces in Vietnam in June. The violence that year included some of the most horrific wartime atrocities committed against civilians in Vietnam, including the Hue Massacre and the My Lai Massacre, while violence in the US claimed the lives of nationally prominent figures, such as Martin Luther King, Jr., and Robert F. Kennedy. The presidential election that year witnessed last-minute attempts by the Johnson administration to end the war in Vietnam sabotaged by the Nixon campaign. By the end of 1968, approximately 550,000 Americans engaged in more than 200 major combat operations, dropped more than 500,000 tons of bombs, and the overall financial costs of the war for that year alone totaled approximately $20 Billion. 1968 resulted in the highest numbers of casualties in a single year with more than 16,000 Americans and approximately 100,000 Vietnamese killed on all sides. All the while, the North Vietnamese and NLF fought on. With a new president and leadership team preparing to take over in January of 1969, innumerable questions remained as to whether a US victory could be achieved in Vietnam. This two-day conference will be hosted at the MCM Elegante Hotel and Suites in Lubbock, Texas. Conference organizers welcome both individual presentation proposals as well as pre-organized panel proposals that include a moderator/commentator and three individual presentations. Conference sessions will follow the standard 90-minute format to include 60 minutes for presentations (20 minutes per presentation) followed by 30 minutes for questions and discussion. Presentations by veterans are especially encouraged as are presentations by graduate students. Graduate student travel grants will be made available to select students. All presentations will be video recorded and made publicly available after the conference via the Vietnam Center and Archive website. Select papers may also be published in a collection by the TTU Press. Proposal submission deadline is February 15, 2018. Please submit a 250 word abstract and separate two-page CV/resume to 1968vietnamconference@gmail.com. The program committee of Ron Milam, Steve Maxner, Justin Hart, Dave Lewis, and Laura Calkins will evaluate all paper proposals and develop a program that reflects the many remarkable aspects of 1968. If submitting a panel proposal, please include separate abstracts for each proposed presentation and CVs/resumes for each speaker. Please join us on Sunday, September 3, 2017, at 6 PM for Vietnam War Movie Night at Alamo Drafthouse as we present the Academy Award winning documentary film, The Fog of War: Eleven Lessons from the Life of Robert S. McNamara. Former Secretary of Defense Robert S. McNamara is the sole focus of documentary film-maker Errol Morris’ The Fog of War, a film that not only analyzes McNamara’s controversial decisions during the first half of the Vietnam War, but also his childhood upbringing, his education at Berkeley and Harvard, his involvement in World War II, and his later years as president of the World Bank. Culling footage from almost 20 hours of interviews with the Secretary, Morris details key moments from McNamara’s career, including the 1945 bombing of Tokyo, the Cuban Missile Crisis, and President Kennedy’s suggestions to the Secretary that the U.S. remove itself from Vietnam. Throughout the film, the 85-year-old McNamara expounds his philosophies on international conflict, and shows regret and pride in equal measure for, respectively, his mistakes and accomplishments. The film will start at 6 PM and will be followed by expert commentary and discussion featuring Dr. Ron Milam and Dr. Justin Hart, associate professors of history at Texas Tech University. For a little over two years now, the staff at the Vietnam Center & Archive have been diligently working on a new and improved version of the Virtual Vietnam Archive. The new version will feature a crisper and cleaner interface, enhanced search capabilities, new record formats, and more records for our patrons to explore (almost 3 million additional pages of material to be exact). We built our new interface using an open source platform called ArchivesSpace, which not only allowed us to add a lot of new features to the Virtual Vietnam Archive but also turned it into a web-based application. There are no more license limits for the number of people allowed to use the database and no more exiting your search session to leave the Virtual Vietnam Archive. Users of the new system will be able to browse our finding aids, and if they find something of interest, click on links within the finding aid to be taken directly to the digitized material. Given the widespread international use of the Virtual Vietnam Archive with more than 2 million searches conduced every year in over 160 countries, we realize and appreciate that we have many research patrons who have frequently used the current version and may have saved links to digital documents for your footnotes, endnotes, bibliographies, and personal reference. So long as you followed our previous guidance and used the links provided within the database records, the links you saved will still function as before. If you have any links that no longer function after our transition, please feel free to contact us directly and we will assist you as much as possible in reestablishing those links. Also, given the newness of the ArchivesSpace interface and differences between the previous and new versions of the Virtual Vietnam Archive, we will be providing online tutorials and additional guidance to help smooth the transition for everyone. As always, we will invite your feedback and observations on how we can improve the new Virtual Vietnam Archive. We are very excited about the new Virtual Vietnam Archive and the ArchivesSpace platform, which will allow us to continue improving the database and its features moving forward. The new Virtual Vietnam Archive will be released in early June. The Vietnam Center and Archive cordially invites you to join us as we celebrate Tet, the Vietnamese Lunar New Year, on Thursday, February 2nd, 2017. Please come sample delicious Vietnamese cuisine and learn more about the rich heritage and culture that makes Vietnam so remarkable. In Vietnam, one of 12 animals of the zodiac represents each year and January 28, 2017, ushered in the Lunar Year of the Rooster. The Rooster plays an important role in everyday life in Vietnam and people born in the Year of the Rooster are said to be hardworking, talented, resourceful, courageous, active, amusing, and popular. family and friends.We hope you will be able to join us! Proposal submission deadline is February 15, 2017. Please submit a 250 word abstract and separate two-page CV/resume to 1967vietnamconference@gmail.com. The program committee of Justin Hart, Dave Lewis, Steve Maxner, Laura Calkins, and Ron Milam will evaluate all paper proposals and develop a program that reflects the many remarkable aspects of 1967. If submitting a panel proposal, please include separate abstracts for each proposed presentation and CVs/resumes for each speaker. Part of the mission of the VNCA is to promote awareness and understanding of Vietnamese culture. If you are in the Lubbock area, please join us for our Lunar New Year party on Thursday, February 18, 4-5pm at the Texas Tech International Cultural Center (in the TTU museum “district” along Indiana at 4th St.). Since this is the Year of the Monkey, here are images from the Virtual Vietnam Archive . 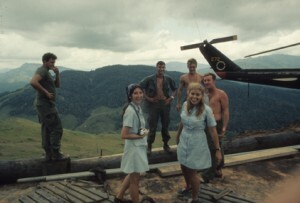 . .
Donut Dollies (aka, American Red Cross volunteers) visiting LZ San Juan Hill, February 1971.